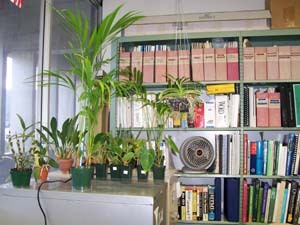 Tropical Plant & Soil Sciences Dept. 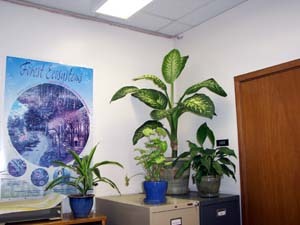 Plants can enhance the decor of any office! Plants "Clean" Air Inside Our Homes. Laura Pottorff, Colorado State University. Although this web site deals with supplemental lighting in the office, it is also applicable to your home, apartment, or dormitory. Location. Ideally, plants should be placed in an indoor location where they receive some sunlight daily--whether direct or indirect. However, this may not always be possible. 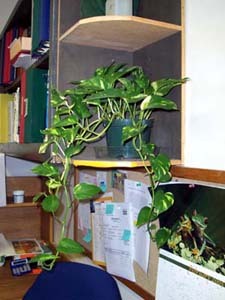 For example, plants in an office with a north facing window may receive no direct light coming through the window. Leave well enough alone. Supplemental lighting is not always or automatically needed. Some plants do fine on their own. Ordinary room light is sufficient. plant is still growing well. 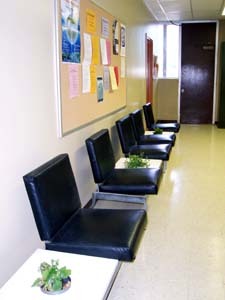 Plants in a waiting area outside elevators. Matching the plant to the location. If you are looking for a plant to place in a particular location, try to select appropriate plants for that specific lighting situation. For example, Chinese evergreen can tolerate low light intensity and would be suitable for semi-shady places. Guide to selecting houseplants. Anne M. Streich, University of Nebraska. Getting started. Try to place indoor plants near a window to get some direct, indirect, or diffused light. If the lighting is inadequate and your plants need supplemental lighting, there are two basic kinds of lighting--fluorescent and incandescent. Other kinds of indoor lighting, such as high pressure sodium lamps or metal halide lamps, are not be covered in this web site. You don't need two kinds of fixtures--fluorescent and incandescent. 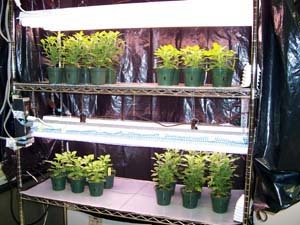 Light intensity tends to be low so you are limited as to the plants can be grown. Again, try to select plants that can tolerate lower light conditions. Indoor plants--cleaning, fertilizing, containers and light requirements. Debbie Shaughnessy, Clemson University. Types. Common types of fluorescent lights are cool-white and warm-white. A combination of cool-white and a wide-spectrum or full-spectrum tube. It is commonly recommended to use a cool-white tube in combination with a warm-white tube. While cool-whites and warm-whites are relatively inexpensive, wide spectrum tubes and high intensity fluorescent tubes are a bit more pricey. Set up. Fluorescent tubes typically come in 2-foot and 4-foot lengths. The 2-foot length works well if space is limited. fixture attached to a wooden shelf. A simple set up can be a twin-tube fluorescent shop light fixture from a local hardware store or garden shop. A fixture that holds two 48-inch 40-watt fluorescent light tubes covers an area approximately 4 feet by 8 inches. These fixtures come with chains to suspend the fixture over the plants so you can adjust the height according to your plants and raise the fixture as the plants grow taller. Besides being hung from shelving, a fixture can be attached to a shelf (for example, with screws). and incandescent lights suspended from metal shelving. An alternative is getting a light cart although this will be more expensive. It does offer the advantages of mobility (wheels) and attractiveness. 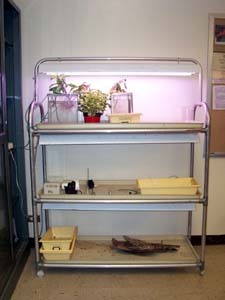 Supplies for caring for the plants can also be stored on the shelves. fixture suspended above the plants. They are a good source of red light. Types. Regular; plant grow lights. Lighting can be provided not only from the top, but also from the sides. Whatever the light source, you can use reflective plastic sheet (film) to direct more light to your plants. Mylar can be added to room walls to reflect available light. An alternative is white plastic sheet. Plastic films that diffuse light can also be used. with a plastic film that diffuses light. Light emitting diodes (LEDs) are becoming more prevalent as a light source, for example, in flashlights. However, they are still relatively expensive for office and home use. 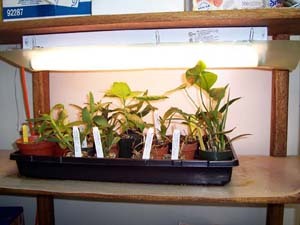 Supplemental lighting for indoor plants. DIY Network. Guide to a green thumb. Heidi Bornhorst, Honolulu Advertiser.